At the top of this steep, rocky hillside is a hideous idol, carved from granite by some forgotten race. 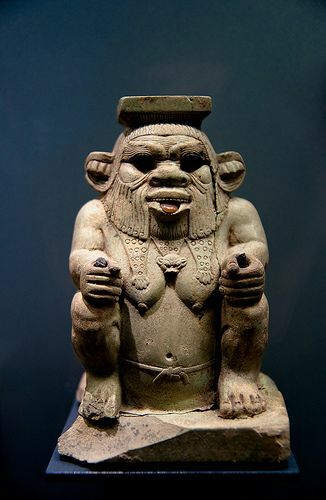 The statue is a fat, squatting, vaguely humanoid figure, whose face is twisted into a hideous leer. 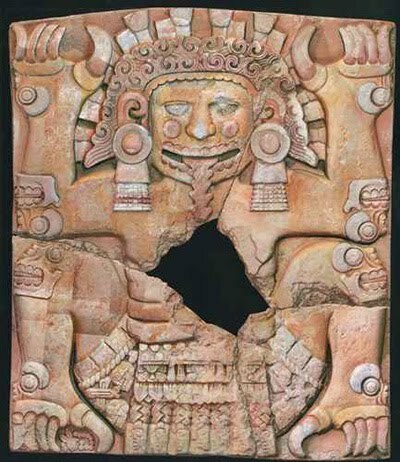 The double doors of this building are elaborately carved with a leering face and grotesque torso. The creature’s mouth is gaping open to display row upon row of hideously pointed fangs. Two long, claw-tipped arms are carved in relief: they seem almost to be reaching out to gather in anyone standing before the doors. This room is dominated by the familiar image of the leering pagan god, as usual carved from a block of granite. The gems that occupied its eyesockets have already been plundered. In your opinions, who is the "leering pagan god" depicted in B5 Horror on the Hill? What forgotten race crafted the idols? I'm actually running this right now for my son and a couple of his friends. At one time, two niches within the statue’s eyes held a pair of fabulous jewels, but these were looted long ago. The "black-hearted cult" who built the monastery on the hill predate the arrival of the hobgoblin king, and were human clerics. Their last surviving member is living with the hobgoblins in the dungeon. In the D&D Podcast, "Dragon+: Mordenkainen's Tome of Foes, 2/6/18" Designer Mike Mearls confirms that the demon is in fact Moloch, an identity which was earlier based on speculation, but now made explicit. 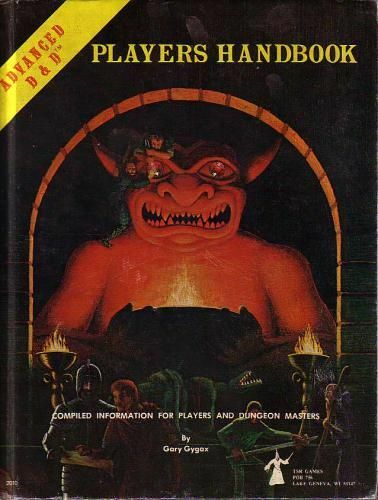 He explains that the demon was used twice in official material beyond its original appearance on the cover of the AD&D 1e Players Handbook. There was a creature called an eidolon in 4th edition that was described as an animated statue, which used the idol design as the basis for its illustration. Mearls goes on to relate a possibly apocryphal story based on Chris Perkins' research. Supposedly, the artist, Dave Trampier, nicknamed it "Molly". Later on, in Monster Manual II, the demon Moloch was illustrated to resemble the cover idol, so the inference was made that the idol was an image of Moloch. Moloch is slated to appear in Mordenkainen's Tome of Foes as a fully statted and described demon, and its appearance will be based on that idol. I read online before a user speculate that it was Tsatogghua, the Lovecraft horror. I doubt that was the intent, but it seems thematic. Niles also wrote Cult of the Reptile God about the same time. That module has a lot of elements consistent with Lovecraft. That is fascinating. I like that Niles was inspired by the AD&D 1st Ed painting. Not sure how I would feel about introducing Moloch into Mystara? Will have to give it some thought. The physical description actually reminds me a little bit of the illustrations of Cretia from module X3: Curse of Xanathon. For whatever reason, I thought the stone demon statue with closed eyes (that turns victims to stone when it opens them) found in the City of Brass in GAZ 2 might be related somehow. The Nithians are literally a forgotten race. That demon statue from the front of the 1e PHB is (and was) quite literally the first thing to pop into my head when I read that description. I think it would be easy enough to ask Doug whether he was in fact basing the description of the idol from the cover of the PHB. I suspect he was, but it would be worth confirming. I looked up the description of Moloch both in the Dragon magazine article he was described in, as well as historically, and it certainly fits the mood of the "black-hearted cult" who built the monastery! I guess the question is whether that's enough to import a form of this devil into the Mystara codex of the immortals? Marco's methodology in the case of the more obscure references was generally to consider them aliases of better developed (or, at least, equally obscure) Immortals. For example, he decided Leptar was the same as Hircimus, who are similar enough that I think little is lost by merging them. I notice that Leptar/Hircimus's symbol is a cat o' nine tails, while Moloch in the 1st edition Monster Manual II is said to carry a six-tailed whip. As an ancient god of fire, Zugzul seems to be pretty close conceptually to Moloch. Perhaps the "bloody cult of monks" who built the monastery in B5 were a group of Magian Fire Worshipers from Ylaruam, upholding the ancient worship of Zugzul under the name Molech or Moloch after being driven from their own land by Suleiman Al-Kalim. Both Zugzul and Leptar/Hircismus can be great aliases of Moloch, rip! I guess whether you prefer having aliases or having them all as separate entities depends on how many different Immortals your campaign might need. Whatever you decide, I think B5's details and the background provided by Paleologos does support the idea of Moloch existing either as an alias or as his own Immortal in the setting. I flipped through X3 this evening, and found that Niles also used gemstones for eyes in many of the statues of Cretia, interestingly enough! Cretia is described as having a gorilla's body with bear claws - brings to mind the shaggy body of Leptar, again. Now that you mention it, I think I drew that connection when I first ran B5 way back. The action in that campaign converged on DA4, in the end. With all the geothermal activity under The Hill, an aspect of Zugzul is certainly a good fit. Slightly off-topic here, but while reading the module recently, I stumbled upon the two greedy sisters (Area 13 on the hill, page 7). One is a magic-user and one a cleric. Now, when the module was written, there weren´t any immortals or churches other than law, neutrality and chaos (or something like that). When I read the entry, the question "what religion could that be?" came to my mind immediately. I don´t think that either of the Karameikan churches would seem to be fitting for this behaviour (well, at least not a natural fit). The powerful illusion hiding their home hints at something bigger at work here, maybe. Any ideas what is going on here? The two sisters presence in the area is indeed curious, and naturally one thinks there is more behind them. I suppose they were just "helps" for the PCs in the author's intention, but I'd like to think they are two of the powerful Crone of Chaos aka Witches of Dymrak aka Nine Hags developed I believe by Havard and Agathokles from the original canon mention of the Crone of Chaos which I do not recall in which module it was? I would also guess that these two are placed here simply to help the PCs for a price, given that the module is from a time when the approach to adventures was still more tactical/wargaming than story-driven, so we get them here without much of a backstory, rather as a magical shop/healing station/information center. Adding an explanation to these details is part of the fun when looking at the old stuff today IMO. Didn´t the Crones of Chaos first appear in some british module, not necessarily a Basic one? However, as they are evil monsters, I don´t think that they would be an appropriate explanation for the sisters - unless they have a deeply hidden agenda and a reason why they act neutrally here (and would register as such if checked). The crones might be an original design by B8s author, then. His name appears in the credits in the creature catalogue as well. Yes but I'd like to use the Crone of Chaos/Hags more as "fairies hostile to humans" than nearly mindless evil monsters. Note also that Detect Evil only reveals creatures who wish to harm the cleric, not chaotic or evil creatures who do not wish to harm the cleric, if that what you mean with "if checked". Noted about the Crone credits. Not sure if this was the only inspiration for Agathokles and Havard if, IIRC, imagined them as allies of Argos and followers of Orcus. I believe part of the inspiration was Karelena, Solorena & Trilena, the witches from B7 Rahasia.